I'm having some problems with my extractions after changing from the original SB double basket. I have switched to the 15 g VST basket. I have not worked out how to control the coffee flow using the recommended coffee weight for the 15 g basket, It would seem to get any sort of control of the flow rate I need to overfill the basket to something like 22 g. If I do not do this the beverage will just gush out of the portafilter. I have also had to decrease my grind to an incredible low adjustment of one. (With the old SB double filter I could easily choke my EM7000) I have not worked out a way to choke my machine using the VST basket = Not that I want to do that, it's just that if I could then would be able to work out a range with which I can work to find that sweet spot. Best I have achieved so far using a grinder setting is one and with a progressive tamp and loading the 15 g VST to 22 g, (at 22g the grind is just touching the filter screen after expansion) I can achieve a very good beverage flow rate from the portafilter but only lasting 20 seconds. The flow rate starts to speed up at about 15 seconds and way to fast after 25 seconds. If I stop the flow at 20 seconds it has delivered nearly 40 mils for a triple shot espresso. I have run out of adjustment on the grinder and it is incredibly fine. Excuse me for the long explanation but can anyone provide ideas which could help lead me to getting the 15 g VST dialled into my Sunbeam EM7000 - would be appreciated. There are a number of users who struggle with vst baskets at first.. my mother has an oscar and bcg820 and I tried using my 18g vst basket on her setup with no luck at first. There were two options. One was to go as fine as possible on the bcg820, which I was not too keen on. Just like you, I could only achieve a 20 second shot. The other was to play around with the brew pressure, this solved the problem. One last option if you don't mind lots of fines in the puck (see how it goes) unlock the top burr and move the position of the red dot to the next position where it locks in and this will allow some more range to go finer. I reckon gonzo is on my money - adjust where your top burr starts and see if you can go finer. Although you could be (and probably are) channeling, for now it'd be due to grind fineness. Try to use the freshest coffee you can get your hands on as well, just as an experiment. The fresher it is the coarser you can get away with. At least it'll help you get in the ballpark faster. After that there are other things you might want to think about with the VST, but get back to us first. If you grind out some grounds at '1' what would you liken the consistency to? White flour, cornflour, fine salt... Etc. it's not perfect, but it'll help us understand what the fineness appears to be like. Thanks very much for the advice one of my thoughts was hmm could I adjust the pressure in my em7000 but a quick google did not return anything so I thought the pump in the Em7000 was set at 15bar with no adjustment. I did think 15 bar was high. have you seen or read anywhere how you can adjust the pump pressure of the EM7000. the BCG 820 did make a noticeable noise change when it got down to 3,2,1 though it was not the sound of metal thankfully its possible I could go finer though I thing the preference might be to adjust pump pressure if that is an option. Also that might be more difficult than adjusting the grinder but I think the grind is incredibly fine at one. I wouldn't get too caught up in basket specs. The shower screen on the EM6910 is very high; presumably the 7000 is similar, so you'll probably need to updose quite a bit... the Sunbeam also seems to respond best to higher doses for whatever reason. Dose low and you'll get a soupy pick and poor extraction - maybe because the fairly "direct" water outlet cuts into the puck? I never weighed the dose I used in my 6910, but I basically overfilled slightly, levelled off and tamped, giving a tamped level a few mm below the top of the basket. Never found a progressive tamp necessary. Dose was probably well over 22g which is what I'm using in the same basket on my ECM with a much lower screen. TL;DR: if a higher dose works, maybe stick with that or source a smaller basket? I had a 6910 and the bottom shower screen seems the same to the EM7000. What I had worked out was that the proximity of grind to the filter screen seemed like the only variable that had any real influence on flow rate, I'm overdosing the VST basket to 22g I have not gone further a bit concerned as taking the basket way out of spec - perhaps I go just a little more perhaps 23 g and see - a smaller basket could be an option too - if grind proximity to the shower screen is the solution. I just pulled another shot with then 15 g basket loaded with 23 g fine coffee - grinder adjusted to one, the shot was a little improved 23 second extraction before it started to run to fast. still looks like I should fill the basket with another gram to take it to 24. Hello and thanks gonzo I adjusted the top burrs from 6 to 5 and backed off the grind to 4 with 23 gram load I the pour was the slowest yet in fact to slow. The puck was soup but slow to pour. I can adjust from here starting with less in the portafiller and playing with grind setting. hmm I only roast my beans just past 1st C could my beans be heavier in weight than a higher roast. would the 1 st crack beans contain more water content or same as longer roasted beans. Any thought from anyone? VST 15g requires a very fine grind and are not suited to cheaper grinders, especially small conicals. This is made even worse when light roasts that are not soluble enough for espresso are used. Grossly over dosing will certainly not help your cause = recipe for very uneven extractions via LOTS of channeling. You would probably find things much easier using a 20g VST, dosed with 20 to 21g. Shoot for 36 to 40g of espresso out in 30sec. Taste and tweak to your preference. 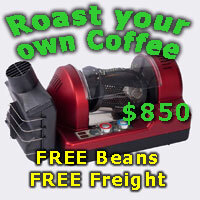 Make sure you buy a fresh roasted coffee that has been roasted specifically for espresso use. acid_rider, gonzo89 and nzgreenbean like this. Yeah you gotta change your roast for espresso dude, try roasting up till first snaps of second crack and see that you'll pull better shots. You can go lighter next roast once you know how far away second crack is from first. Vinitasse and gonzo89 like this. You need a more robust grinder for handling finer grind - Breville & Sunbeam grinders are not designed to handle this fine and this light. You need something more commercial-built. I roast a bit past first crack too so it definitely works - I find roasting close to second crack gives me too roasty flavor (roasting light has its problem too if it's not done properly). Thanks readeral as I thought - its a real learning curve I did a roast this morning pushing the beans a little further will see how this goes too, I'll go a bit further again on the next roast to. I use to roast a lot darker but was never to happy with the results - what I worked out was I was baking the beans. 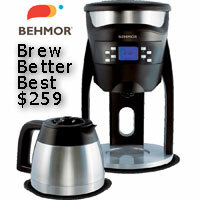 I have learnt from the experiences and do a reasonable job in the Behmor especially after lowering the bean levels from 300 g to 220 g.
my partner had the opinion my coffee was better than in many cafes, wonder what she will say now after the change to the VST basket, because I'm tasting way more flavours. Not baking beans can be hard when you're roasting so long, but give it enough energy into first crack and you'll get to 2nd ok. I think you can get away with using your VST in conjunction with your breville. Won't be ideal, but don't upgrade your grinder yet. Prove its capability first :P also, you can do a crap tonne better than a Mazzer Mini when you upgrade. I can complete a roast in 11.30 minutes for most beans 220 g and some SHB up to 12.30 minutes I reduce heat hearing 1st crack finished, I'm only a matter of seconds away from reaching 2nd crack though I reduce heat so not to go into 2nd crack - the aim is getting very close i.e. closer than I usually do. Ah, if you're already at 22g more coffee probably isn't the answer. It does go to show how high you need to dose these machines though! I’m onto my third pump in this Sunbeam EM7000 and also the third steam valve which is particularly weak and susceptible to build up of scale despite regular cleaning cycle. It is just as well the parts are easy accessible and replaceable. This morning coffee was a text book pour, interesting to wasthe gauge being in the optimal setting recommended by Sunbeam but moreimportantly the flow rate was a steady mouse tail throughout the poor from theportafilter and providing good creamer too. The puck was good but still I’mover dosing the VST basket. In comparison to the double SB baskets the puck compared tothe VST 15 g is considerably thinner. Over time I’ll see if I can tweak thegrind and amount off coffee down to see if I can achieve 16 g in the basketwhile maintaining best known parameters for a good espresso. Maybe worth trying a Synesso double basket - considerably larger and more forgiving than the Sunbeam double (I haven't used a VST, probably should've mentioned that in my post above ). I just pulled 40 coffees (split - so 20 portafilters worth) from a 20g VST for a group breakfast this morning, and I have to say it's undoubtably my favourite VST basket. If you're wanting to be in the 20g range, I highly recommend. I was using a fairly dark roasted bean however (not oily, but definitely roasted for espresso). Hopefully you can manage those darker roasts soon and find similar joy with your 15! Re grinders, you could find a plethora of options. Macap M4D, lower end of Compak E range like the E6OD, if you want to stay in the Mazzer world then a Super Jolly would make you much happier, and I personally use (and highly recommend) the Profitec T64. I was filling those 20g baskets in 7 seconds this morning. I would've been tearing my hair out with a Mazzer mini. acid_rider, Steve82 and nzgreenbean like this. I just pulled 40 coffees (split - so 20 portafilters worth) from a 20g VST for a group breakfast this morning, and I have to say it's undoubtedly my favourite VST basket. If you're wanting to be in the 20g range, I highly recommend. I was using a fairly dark roasted bean however (not oily, but definitely roasted for espresso). Hopefully you can manage those darker roasts soon and find similar joy with your 15! I do similar, it is my go to for larger gatherings. Loaded hopper, dose 20 to 21g in 5.5sec straight into PF, quick tap, tamp and pull. Split into 150ml Nuova point cups, makes a perfectly sweet, balanced little milk drink that people can't believe it has no sugar in it. Extremely consistent in all aspects, flow, colour, yield / tds. Ive just recently bought two VST 15 and 20 g so Ill stick with these see how it all works out, although the pour is greatly improved and I'm only at day two so I cant complain and I'm sure it will get better from here especially after tuning into this forum a great bunch and a wealth of shared knowledge. I do have the 20 g basket which I use split. now I did another roast and let it go into 2nd crack before pulling it, though only letting it go for about 10 to seconds in the Behmor, my usual process is to remove the basket from the Behmor and take it outside for faster cooling, as I exited the house the beans could still be heard in 2nd crack and stopping as the cool air got to them. less than 20 seconds in 2nd crack, the beans colour looks great much darker. I was eager to try them so I let the beans sit only half an hour before having a flat white in whole milk - very nice taste. Tomorrow Ill try an espresso after the beans have sat a while. I get your point too, in comparison my BSG 820 takes 2 shots at 10.6 seconds do get the dose I'm using about 22 g. I still have some experimenting to do with more appropriate weight matching the basket. I though I would enjoy some coffee before experimenting again, as the pour is good = 27 seconds for just over 40 mils of beverage. 1) To those who think dark roasts are preferable - that is not the only way... Personally, I prefer light roasts. Oh, and I cannot abide even the slightest hint of burnt, baked or wood (or, for TC, "wheatgrass"). 2) So far no one has mentioned the "roasts are best between 4 and 11 days" concept. That does not apply to most lighter roasts. Some light ones I use do not even come on stream until three to six weeks. If it still smells green - it is! If you are roasting light, they are possibly still underdeveloped (aged) which will throw your results out. Of course, if you are an "amount of crema" freak, the older the roast the less the quantity of crema. When any roast is fully developed, the crema quality (flavour) will be at its best for that roast. 3) Your grinder should be able to handle the VST easily. So many CSrs seem to think they won't deliver a good cuppa (too much "S" at work I think). I have a variety of friends with Breville Smartgrinders and SB 480's. They should work well with the VST IF you can grind fine enough to suit the pour. I lived with a pair of 480's for a couple of years - they coped well enough. I tried a whole bunch of other grinders and ended up with two Mahlkonig Vario gen2's - they were the only step up until well over the $A2500 (each) mark. BTW - the gen3 is now out, so my grinders are not "bleeding edge" anymore. 4) To the whole overdosing thing - I have owned two 6910's and a 7000. They only need to be overdosed if the roast is poor (including too young or too dark etc. ), the grind is too coarse, the tamper has a curved base or the machine setup is wrong. The reason for that particular myth seems to have more to do with the fact that a 6910 / 7000 will handle overdosing with more aplomb than a lot of other machines (including some commercial ones which are a lot more expensive). To get the best out of a VST, the VST manufacturer recommends dosing within 1g of the rated size. Once all the usual suspects are dealt with, my own experience is that a very slight overdose (i.e. 15.4g in the 15) gets the best result. Every time a friend does a massive overdose in the VST I have made a better coffee using "close to the standard dose" using their gear. 5) Scales accurate to within 0.1g are essential to setup a VST with minimal pain. Otherwise you are literally "shooting in the dark" as each basket's dose will be different enough to make any diagnostics irrelevant. PS I mainly use a VST single dosed to 7.2g. When you optimise a VST the extra flavour means that you do not need mega doses anyway. Last edited by TampIt; 6th May 2016 at 11:36 PM. Am I the only one that thinks VST's are a overhyped piece of equipment? I have several VST baskets which I stupidly splurged on when I first got into my home setup thinking it would deliver the best results, after all of which I've gone back to the standard LM baskets a long time ago. I'm yet to be convinced the VST's make much of a difference, especially in milk based drinks. pyrmontboy200, TC and Yelta like this. [QUOTE=evro50;578953]Am I the only one that thinks VST's are a overhyped piece of equipment? I have several VST baskets which I stupidly splurged on when I first got into my home setup thinking it would deliver the best results, after all of which I've gone back to the standard LM baskets a long time ago. I'm yet to be convinced the VST's make much of a difference, especially in milk based drinks. No argument from me Evro, tried the VST's many moons ago, they quickly found their way into my drawer of unused bits and pieces. Like you, have pulled them out a number of times, thinking perhaps I had missed something, each trial only served to convince me that they were only a well promoted piece of equipment that failed to deliver. They now languish in the bottom drawer, I now use my EP or LM baskets exclusively, and I might add with great success. Just use the baskets you like. *shrug* I like my VSTs, I make consistently good coffee with them. acid_rider and gonzo89 like this. I think the message to novices is that excellent, easier to use baskets, are available at a much lower price than VST. I can get good shots from the VST's as well, however much less stuffing around with the other baskets I mentioned. That is a good and valid point Yelta.. I personally like the results from my vst baskets and they did originally cause a bit of a headache. Never have trouble using them consistently anymore but as you said, for a beginner or someone who doesn't have the time to play around with the parameters of their setup, perhaps go for other reputable easy to use baskets mentioned in this thread or you'll just get angry at wasted coffee. I currently have a 18g VST basket, and I'm toying with the idea of getting a larger 20g or 22g. I must admit this is after talking to a number of cafes which uses 21.5g or so in their basket, and I'm trying to replicate what they do. I know that commercial machines will be different to my Rocket V3. - I know that VST recommends dosage +/- 1g of the recommend dosage. - However, I've read quite a few number of people who have exceeded this, including cafes. For example, they would pack 21.5g into a 20g VST basket. Can someone point me in the right direction and stop me from buying all these different baskets? Yep, buy one of these Precision filter basket 58mm- Espresso parts | Talk Coffee 18 to 21 gram, you won't look back. Just do what you want to do makfelix. If you want to replicate your cafe's equipment, sure pick up a 20g. But honestly, having another basket to put a 19g underdose instead of a 19g overdose - not worth the cost of entry. I bought a 20g that I could fit in my portafilter (22g too big) and overdose to 21g to split the shot. Generally I use my 18g basket at 17g dose for a double shot flat white. To me, for my purposes, the 4g difference justified the purchase. If you reckon you have a good reason for it, go for it. Slightly related - There's a lot of people who seem to just buy whatever others buy without working it through. Drives me crazy to read about it. I bought VSTs nearly 12 months after I bought my first espresso machine, even though I knew I intended to purchase eventually. Why? Cause I wanted to get my skills up first. Why did I get the baskets in the end anyway? So I could work to set recipes and have a fitted tamper. I had also worked with VSTs in a cafe over summer and was satisfied they were an improvement for me. My advice for anyone wanting to buy VSTs is to pull some shots with your local site sponsor, just to take the mystical shine off before purchasing. acid_rider, Magic_Matt and gonzo89 like this. Depends on the screen distance. My 16gr basket take nicely 18.5gr, with older coffees up to 19, more that it's the 20gr basket. What's useless for me is the VST 14gr, it takes at most 16gr and requires extreme fine grinding, really a pain to dial in. Just to add a couple of things I recently discovered with my VST 15g double basket. I found that using a perfectly flat-bottom tamper that is >58 mm works best with VST (and perhaps others too?) double baskets. My old trusty 58 mm tamper has a small bump in the middle so its no flat and it has too much free-play inside the basket. This seems to make a noticeable difference to VST and I suspect some other baskets. So I bought a 58.5 mm tamper Pesado, which works a lot like engine piston inside VST basket and it makes a noticeable difference to the end result as well as makes the tamp easily repeatable due to absence of any side-to-side free-play when applying tamping pressure (typically only medium strength is required with a good grinder). Just take it out slowly and gently after the tamp down, as the suction may disturb the puck! With dosing what I discovered that VST when dosed correctly (15-16 gram in VST-15g), it has a lot of head-room above the puck and it gets very wet after extraction is done. It also does not come out very easily and often crumbles at the edges when you knock it out. This is just what it is, and I had to learn not to worry about it and only focus on the pour and final taste, not to focus on the puck's looks after the extraction. This is probably very different technique to other double baskets on the market, I dont know, but not for VST. Once these rules are followed, it produces very good results. Clearly many people here feel the complexity is not justified, which is OK, each to their own. But, if I am not mistaken, 2012-2013-2014-2015-2016 WBC were won using VST 20 gram baskets so there must be something good about them when used as recommended. on others with just 1 mm more more shower-screen headroom you may be best with 16 grams in VST-15g i.e. +1 gram up-dose. This is all inside the optimum range that VST recommmends i.e + or - 1.0 gram. Finally I also think that VST basket probably 'demands' a better grinder than many other double baskets but having a better grinder is always beneficial with any basket, it is money well spent. Had the same problem with VST 20g basket for my Breville 920 coffee machine ! I believe one of the really big issues is the breville grinder too! But i have the same problem , with dose 21g i can pull an ok shot for 23 sec include preinfusion that is 5 sec . After 24 sec , just water coming through the pf . I usually try different coffees to see which one i like more . I have found that if you try to get a perfect shot the taste is so much different that you can drink it without sugar .